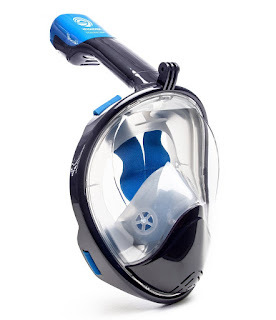 Today ONLY (7/19), this Full Face Snorkel Mask is $49.98 - $69.99 (Retail $109.99)! •180° FULL FACE DESIGN- Our snorkel mask makes it easier than ever to breathe comfortably through your mouth or nose while you are snorkeling. Our mask and snorkel provide a 180° viewing area- the biggest of any snorkel mask on the market today guaranteeing that you will see more fish and sea creatures than ever before. With our integrated GoPro Mount you can easily attach your GoPro camera to capture and share your adventure with friends and family. •DRY SNORKEL TECHNOLOGY stops salt water from getting into your mouth and prevents gagging. Spend less time worrying about water in your mask and more time snorkeling! •FOG RESISTANT DESIGN- There is nothing worse than dealing with a mask that is constantly fogging up. Our innovative design features a separate breathing chamber that creates an airflow away from your main viewing visor that helps eliminates fogging and will keep you snorkeling longer. •EASY TO USE- So you spend less time fussing with equipment and more time enjoying your snorkeling experience. •PROPER USE- Full face snorkel masks are designed for leisure surface snorkeling. Serious freediving is not recommended. Strenuous swimming while wearing any type of snorkel, including full face designs, is not recommended. Be sure to take regular breaks while snorkeling. Also follow the buddy rule: never snorkel alone.